In this scene, the Buddha of the past, Dipankara, is shown preaching to the young brahma-carin (Brahmanic student), the future Shakyâmuni. 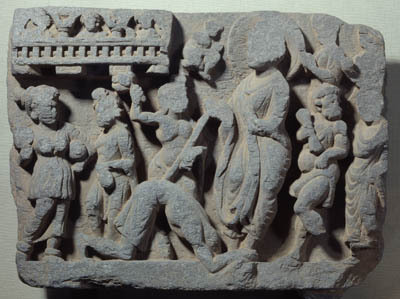 The tableau is presented in the style of a frieze; visually, it displays closer affinities with the art of Imperial Rome than that of Buddhist India. Respecting the three classical unities of time, place and action, the episodes may be read from left to right. The first part depicts the bargaining with the young girl over the blue lotuses, which the bodhisattva wishes to offer to the Buddha as he arrives in town. The bodhisattva has turned round and, his arm raised, is throwing the flowers to the Buddha. The scenes of the miracle and the conversion then follow: the offering hangs suspended above the head of the Tathagata, forming a halo, while the brahma-carin prostrates himself before the Buddha. Dipankara then predicts that the student himself will experience enlightenment in a far-off future and will bear the name of Sakyamuni. This work, (originally coloured), was carved from a slab of stone which was then embedded into the masonry of monastic buildings by means of tenons and mortises. These earliest northwest Indian local representations of the “biography” of the Buddha, expanded into complete narrative cycles, were placed at the foot of stairways and on the bases of shrines. They possessed a triple function ornamental, edifying and didactic and were like veritable illustrated books decorating such buildings. The Kushan emperors who ruled Northern India, Pakistan and Afghanistan were enthusiastic patrons of Buddhism and Buddhist art. Under their reigns, the religion prospered and numerous monasteries were built. Strategically located on the Silk Road, both Kushan Buddhism and its iconography were to spread as far as China.